The National Council of Canadian Muslims (NCCM), a prominent civil liberties and advocacy organization, is calling on supporters and fellow Canadians to immediately write to Toronto City Council to thank them for a major new anti-discrimination campaign. 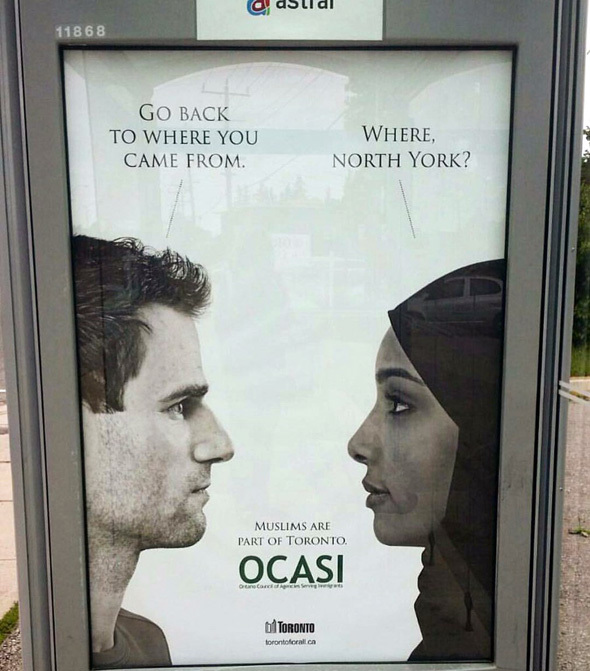 The campaign is a collaboration between the Ontario Council of Agencies Serving Immigrants (OCASI) and the City of Toronto and is meant to highlight issues of Islamophobia and xenophobia which can negatively impact on newly arrived immigrants and refugees, as well as on long-standing communities. Bus posters with the image featured above, as well as other similar images, have appeared across the city and on social media with the hashtag #TorontoForAll. There is also a dedicated website. The NCCM is a partner on the campaign.